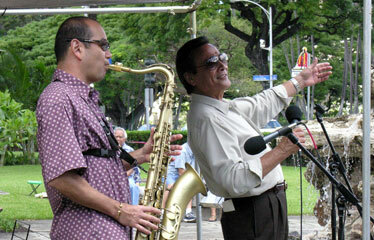 Jimmy Borges sings while Tim Tsukiyama plays saxophone during the "Lent & All That Jazz on the Green" at Kawaiaha'o Church. This year's event is at noon Wednesday. The six-week season of Lent is being observed by Christian congregations with guest speakers and musical and meditative programs. All are open to the public. » A concert of "Bach Vespers for Lent" will be presented at 7 p.m. tomorrow at Lutheran Church of Honolulu, 1730 Punahou St. The church choir and Compline Choir and the Bach Chamber Orchestra will perform with soloists Sarah Markovits, Georgine Stark, Carl Crosier, Ian Capps, Les Caballos, Timothy Carney and organist Katherine Crosier. » The Rev. Philip Chircop, a Jesuit retreat master, will speak Tuesday and Wednesday at two Honolulu Catholic churches. His talks will be at 10 a.m. at St. Pius X Church, 2821 Lowrey Ave., followed by lunch, and 7 p.m. at Sacred Heart Church, 1701 Wilder Ave. A reconciliation service will follow at 7:45 p.m. Wednesday. Chircop, retreat master at Manresa Retreat Center in Pickering, Ontario, led a retreat for Hawaii priests last July and has spoken several times at Lenten missions here. » The Rev. Bob Miyake-Stoner is leading a continuing study session examining peace from the view of the three Abrahamic religions, Judaism, Islam and Christianity. The "Shalom, Salaam, Peace" series is at 10 a.m. Wednesday and March 21 at Harris United Methodist Church, 20 N. Vineyard Blvd. A noon meditative service with scriptures and music will follow. » Kawaiaha'o Church offers jazz music and reflective Lenten commentary at its noon Wednesday series "Lent & All That Jazz on the Green." Attendees are urged to bring a lunch. Music on the lawn at 957 Punchbowl St. is by pianist Betty Loo Taylor, who will be joined next week by vocalist Joe Distephano, trombonist Les Benedict, bassist Steve Jones and drummer Sonny Froman. It will be presented through April 4.